This week’s SmackDown from Indianapolis featured two World Cup Qualifying matches with Jeff Hardy vs. Samoa Joe and Randy Orton vs. SmackDown’s newest acquisition Big Show, the latest instalment of Becky Lynch vs. Charlotte Flair, Miz TV with AJ Styles and Daniel Bryan, and the conclusion of “One Night in Milwaukee”. 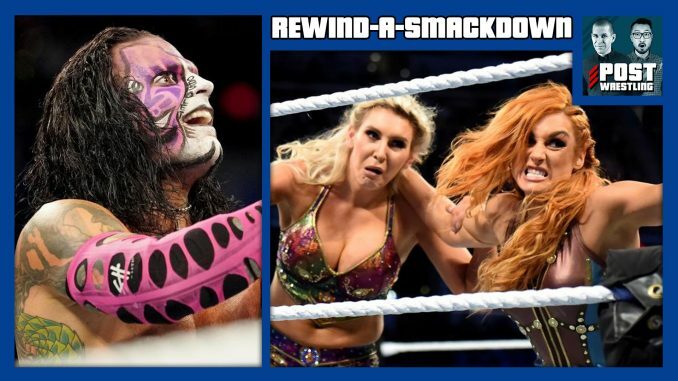 Wai Ting reviews this week’s Mixed Match Challenge with Bayley & Finn Balor vs. Braun Strowman & Ember Moon and COUNTRY DOMINANCE vs. AJ Styles & Charlotte Flair. We discuss TODAY’S TOP STORIES including the latest on Kevin Owens, Daniel Cormier vs. Derrick Lewis added to UFC 230, Dustin Poirier out of his fight with Nate Diaz, the matches announced for Power Struggle, teams for the Super Junior Tag League and more. Enter our #POSTHaiku contest to win a copy of “Creating the Mania” by Jon Robinson from ECW Press by sending us a Haiku poem on Twitter @POSTwrestling for your chance to win a copy.